Students of all ages progress through the karate curriculum from white belt to black belt and beyond. In Addition, the Dojo subscribes to the Long Term Athlete Development program developed by Karate Canada. Students develop both physical and karate literacy. Students focus on skill development and karate excellence. 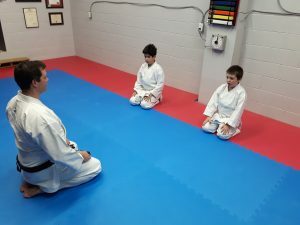 Students focus on life-long karate development. Family members: are you looking for something to do together? Why not develop your martial art skills in this fun and age-appropriate environment? Open to participants aged 5 and up. Special group rates may apply. Specifically tailored to the home school community, this program merges karate skills with the academic, cultural, historical, and spiritual aspects of the art in partnership with your home school curriculum. Click here for more details. This delivery is designed for middle-aged to older adults wishing to reap the social and physical benefits of karate without the impact or strain of high performance training.